Anti-Republican Culture: Michael Ramirez Gets Your Attention. 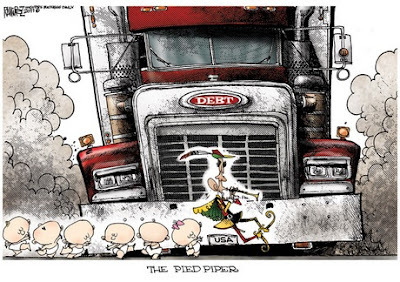 Michael Ramirez Gets Your Attention. Investors Business Daily has an editorial today that displays the Michael Ramirez cartoon shown above. The editorial is a critique of yesterday's speech by President Obama at George Washington University. The President's speech was an effort to counter Paul Ryan's budget proposal. The speech was political in nature, and incorporated some problematic assumptions. President Obama says that America will save $1 trillion by lowering interest payments on the national debt over the next twelve years. He apparently expects us to believe that interest rates on the national debt can be reduced from the current level of 0.00%. If you want to understand the impact of the current budget debate, look no further than Mr. Ramirez's cartoon. Do you recognize the Pied Piper leading our children into a dangerous future? It's President Obama, and that's devastating. Standard and Poor's lowered rating on United States debt repayment will increase the interest rate on that debt. The Presiden't assurance that he will lower the amount of interest payments on our national debt is looking more and more like another empty promise. Mr. Ramirez has another commentary on our debt burden at IBD.